Recently I have created form validations for Change Password functionality. This form will have 4 important fields ( User-id, Old-password, New-password, Confirm-password). 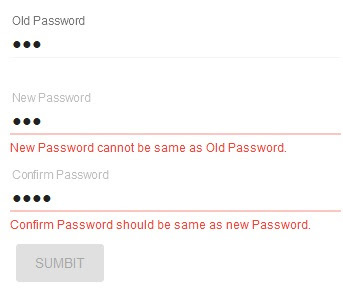 Here Old-password should not equal to New-password and New-password should be equal to Confirm-password. Now here we need two directives. One directive is matching Old-password with New-password and another is for matching New-password with Confirm password. In this article, I have implemented the example with AngulaJS material UI. Now I am going to implement change password form field validation here. Find highlighted part of below code. Thanks for the info. You have painted everything in great detail. Now, using passwords should be easier. AngulaJS material UI should simplify the work (thanks to your example). I plan to use the acquired knowledge for my app store search optimization project.